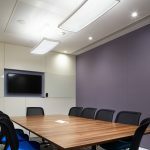 The new education spaces in the lower levels of the University Building project building give further capacity in the basement of City Univerity of Londons’ Drysdale Building. 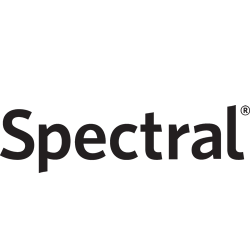 The new educational space provides a substantial number of lecture theatres and seminar rooms that will accommodate a busy teaching programme aimed to stimulate and engage students in a collaborative learning environment. 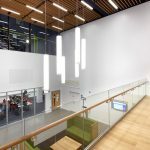 BDP Lighting specified the 1600mm long version of Spectrals Aoca pendant for the central hub areas adjacent to the lecture theatre spaces. 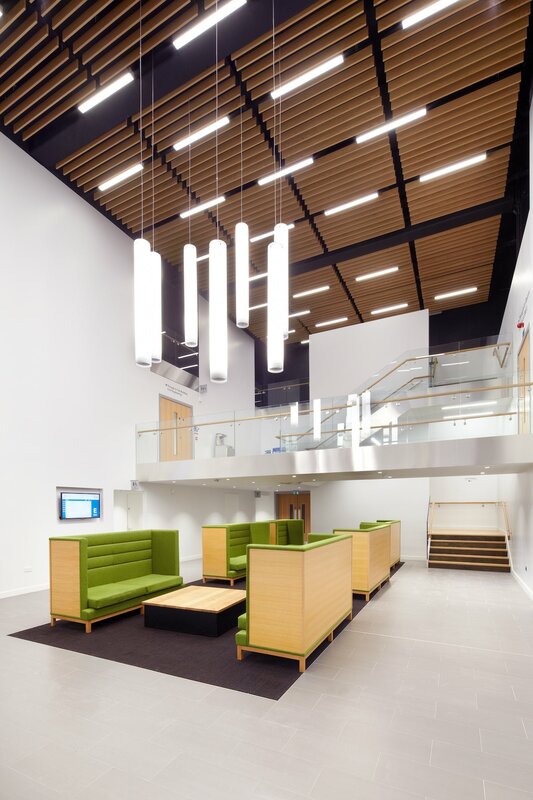 Below ground level meant lighting played an important role in creating vibrant areas for students to use. Aoca provides a uniform column of efficient LED light reducing maintenance dramatically and producing diffuse light that does not produce glare when sitting beneath or approaching via staircases from above. 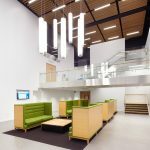 Whilst maximizing the use of daylight, artificial light was used to “stimulate and engage students in a collaborative learning environment. Pergament features a holographic effect to the entrances to each lecture theatre despite offering a high level of efficient LED lighting. 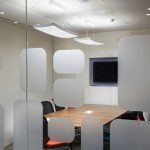 So often LED’s create small areas of intense light that can be uncomfortable on the eye – Pergament completely shields the view of the LED’s and can be seen right through its clear form.